The themes of this mixed media exhibition circle around feminism, the construction of identity, which can be a painful process and the problematics of the language of art. Featuring works from three artists with contrasting backgrounds from Finland, “Feminist Joybox” combines a multiplicity of materials, installation works and performative action. The space is created to be tactile and interactive using self-styled gaming machines, whilst also giving a freedom to only observe. 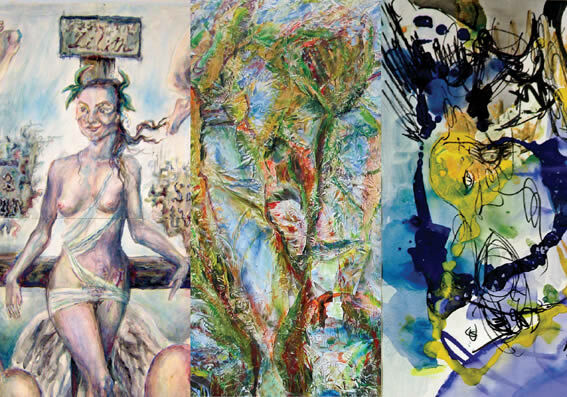 All three artists started as painters, expanding their practice to encompass a wider field of expression. Using “trauma is beauty” as a motto, there is a personal impact in the making of each work. “Feminist Joybox” aims to critique the boundaries of modern society in an ironic way, twisting ideas of self-healing into a humorous tableaux of experiences. Hanna Nauska is an interdisciplinary artist and uses the term ‘trans-media’ to describe her practice as she constantly moves from performance to video, to painting, to text, to sculpture, and sound. Her work is seated in surreal fantasy and dark humour. Hanna Nauska was born in 1978 in Kirkkonummi, Finland and graduated from Dartington College of Arts England. Anne-Mari Pasanen combines female characters into sketchy abstract settings, making use of bold and expressive brushwork. Her style is impulsive and physical, and she uses her personal experience to convey experiences about the world. Anne-Mari Pasanen graduated from the Free Art School in 2008 and is a member of the Finnish Painter’s Union. Isabel Pathirane describes herself as an impressionistic expressionist painter. Her approach is physical and intuitive. She strives for the same kind of directness that manifested in virtuosic improvisation. Born in 1983 in Stockholm, Sweden, Isabel Pathirane lives and works in Helsinki, Finland, and is a post-graduate from the Kuvataideakatemia (The Finnish Academy of Fine Arts).